Our readers are also our writers. Email us an account of your time in the Hluhluwe Reserve and we'll email you a travel voucher, which can be used to discount the price of your flights, car rentals, accommodation and cruises. The Hluhluwe-iMfolozi Game Reserve is now simply called the Hluhluwe-iMfolozi Park, but is commonly known as the Hluhluwe Reserve, and is the only spot in the KwaZulu-Natal Province where you can find the big 5. It contains more white rhinos than any other park in the world, and has a higher density of rhinos than the other parks. To see the wildlife you can drive (night or day safaris) or go on a guided walk in the Umfolozi Park (day or overnight). (Want to hear how Paula got to South Africa - read her review of an SAA Perth to Johannesburg flight) I stayed with relatives in Kloof for a few days before taking a bus to Empangeni KwaZulu Natal as this was the only way that I could afford to get there. I found the bus trip very comfortable. Unfortunately the in house entertainment equipment wasn't working but the seating adequate. With security a main concern I found myself extremely isolated during the day. While everyone else was at work or school I was housebound without transport. My first trip to the Umfolozi Game Reserve proved to be the highlight of my stay. From the moment we entered the park there was an air of anticipation, hoping to see some wildlife. Moments after entering we spotted Zebra grazing nearby and shortly after that a family of warthog wallowing in a mud pool at the roads edge. We watched as these curious creatures entertained us with their antics. The animals weren't terribly worried by our presence, although thoroughly alert. The day was already proving to be a hit. Some time later after sighting a family of rhino in the distance we rounded a corner and were about to witness something extraordinary! We came to a grinding halt, there on the left of us were a pack of African Wild dogs frolicking, playing a tug of war with the front leg bone of a small antelope. We were mesmerised. 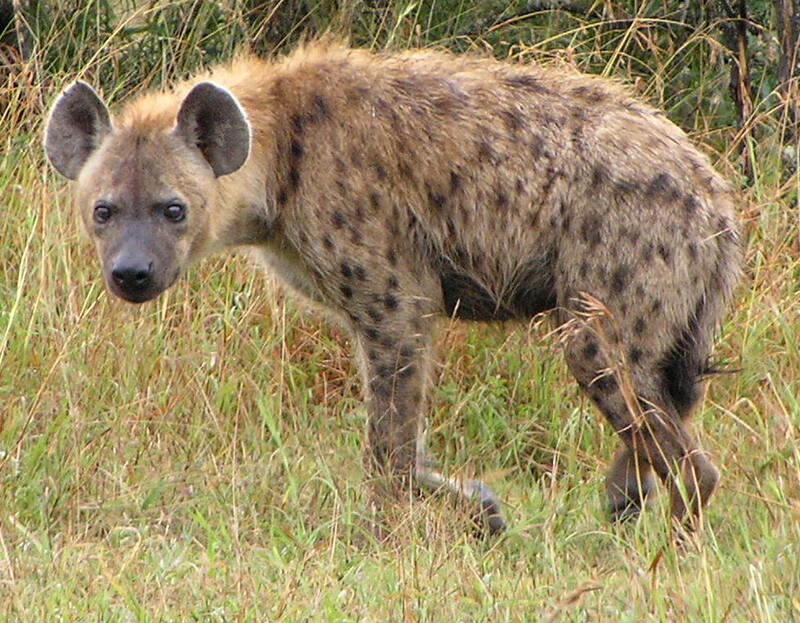 Then to our astonishment a hyena came skulking across the road intent on stealing the dogs' bone! 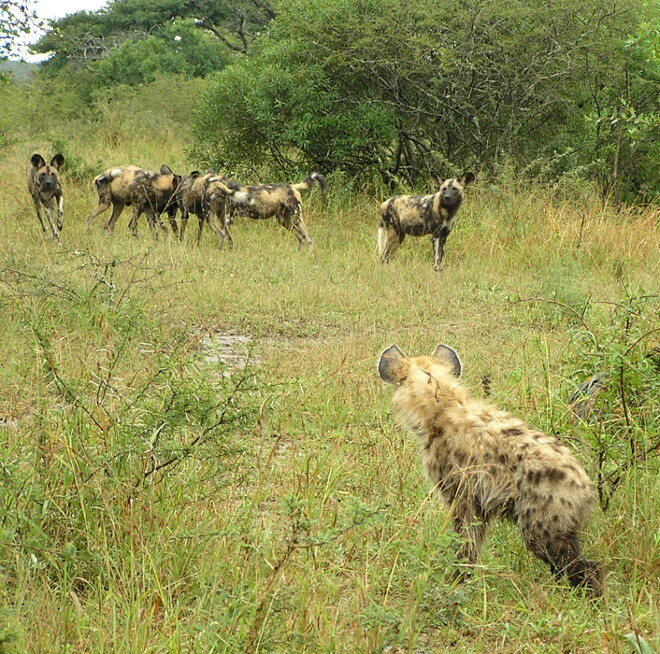 We could not believe our eyes when following close behind the hyaena came it's pup. Needless to say our cameras were clicking furiously as the saga unfolded . None of the animals appeared to be particularly perturbed by us. As the hyaena came close to the pack, the dogs split up and circled as their leader gave chase, as if this was a carefully rehearsed tactic was employed. This went on for some time as the animals repeated their stalk and chase games. This was the most exciting and thrilling scene as the tactic. I felt so privileged to have witnessed it. The dogs finally wondered off and the hyena and her pup quickly tried to retrieve the left overs. This little episode had such a profound effect on me that when I returned home I was inspired to paint a wild dog. My painting has gone on to win a couple of awards, one being the Gold medal Award at the 30th Anniversary of the Queensland Wild Life Arts Society. So my travel experience in Africa was awe-inspiring and will stay with me forever as being one of the best experiences of my life! The town called Hluhluwe is situated about 13km outside of Hluhluwe Game Reserve, and offers the opportunity to stock up on goods at the supermarket. If you've got the money stay at the main camp at Thanda Private Game Reserve (not the tents, unless you want a more rustic experience) which is situated 23km north of Hluhluwe. The game drives are the main highlight, but you may also enjoy the plunge pools, private viewing decks, a kids program and a spa. The Rhino River Lodge is in the Zululand Rhino Reserve on the Msunduze River. Visit Zamimpilo outdoor craft market which is nearby. Choose a Log Cabin. If you're lucky you'll see impala and warthog on the lawn. A cheaper option is the Wildebees Ecolodge which is near False Bay park some 15 minutes drive from Hluhluwe with simple self-catering cabins (option of paying for meals and eating around a campfire) and a pool to enjoy. There are some dogs which wander the property. Ezulwini Game Lodge is in a reserve where you can wander around without worrying about getting eaten alive :) For something a bit different try staying in the Tree House. Without leaving the lodge, you are likely to see buck, giraffe, zebras and a huge variety of bird species. Fly from Johannesburg to Richards Bay Airport. Hire a car in Durban, and then it's a 3 hour drive from King Shaka International Airport to the Hluhluwe Reserve, mostly along the N2 national road. 1989. The Umfolozi & Hluhluwe parks are joined. 1981. 23 wild dogs were released into the reserve, in an attempt to introduce the species. 1934. A Visitor camp is built at Hilltop. A Cheetah rehab centre called Emdoneni. See traditional basket weaving at Illa Weavers.